This county is one of the few counties in Iowa that has had only one county seat and today Corydon remains as the hub of governmental activity within Wayne County. 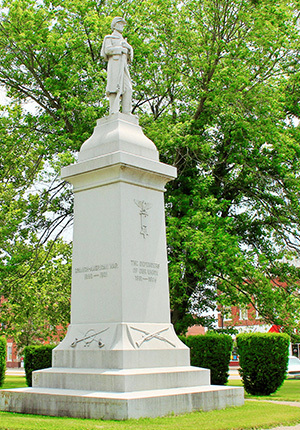 The commissioners chosen to locate the county seat in the spring of 1851 selected the site where Corydon stands and gave it the name of Springfield. When it was discovered that there was already a town in Iowa with that name, a change had to be made. Corydon was renamed by Judge Anderson who won that right in a poker game. Judge Anderson, who was originally from Corydon, Indiana, used the name of his hometown changing the name from Springfield to Corydon. Today the quality of life in Wayne County is a mix of small town charm with successful industry. The county boasts excellent schools and state of the art healthcare. There are unique shopping opportunities, restaurants, and overnight accommodations. Recreation in the county consists of picnic areas and camping as well as some of the finest hunting and fishing in the state. Other outdoor activities in Wayne County include two nine-hole golf courses, swimming pools, tennis courts and trails. Wayne County is home to the Prairie Trails Museum which showcases the history of this area. This museum is often referred to as one of the finest in the country and gives visitors a true glimpse into our past. Many people travel to Wayne County to see the outstanding Mormon Trail Exhibit. This interactive display is just one of many exhibits in Prairie Trails Museum that accurately depicts the life and time of those who came before us. Come spend some time with us in Wayne County. You will be glad you made the trip.